Debra Bartz is the owner of Learn Conquer Soar Coaching, a lifestyle coaching company that provides services that promote health and wellness. 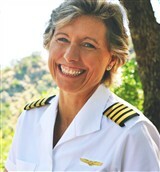 Ms. Bartz started the company in 2010 after dedicating more than 30 years to piloting aircrafts, which she continues to do as the captain of Airbus 320 for United Airlines. An expert in holistic and integrative nutrition, Ms. Bartz is tasked with coaching and writing blogs. She attributes her success to her leadership skills, and to her ability to take action when necessary. Looking toward the future, Ms. Bartz would like to build her business on a global scale.